Our endeavor is to separate the mining operations from the electricity costs, as well as diversifying investments to make the business safer and more independent from any market variable. This guarantees a complete payout to the token holders: in case mining become no longer profitable, it will be gradually replaced by our other activities (hosting/housing, application design/development, and electricity sales). The crypto-mining activity is strongly influenced by the electricity price and availability because the success of this business model is largely dependent on the energy supply. 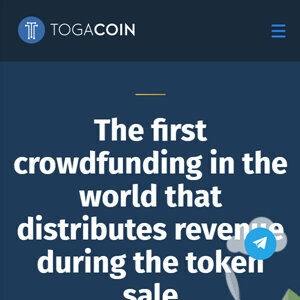 TOGA’s business model is part of a new generation of mining operations, which is climate-friendly, less subject to the fluctuations of energy price and, finally, more profitable and safe as it combines green energy sources with the business diversification.